See Price and Swatches HERE. I am back with another NOTD which is really easy to do and looks very beautiful and the best thing is you wont need any tools to do it :) Just a tooth pick or a dotting tool is enough. Thank you all for taking part in my Memebox Giveaway. It was really sad to see so many fake entries but YEY!! to all of you guys who participated honestly. Congrats Girls!! Kindly contact me within 48 hours with your postal address and contact number to claim your prize. Those of you who did not WIN don't get disheartened. There are many more GIVEAWAYs to come, one of which is coming real soon. Oriflame The One Color Impact Cream Eyeshadow were launched some time back. You can see the Description, Price and all Swatches HERE. L'Oréal Paris starts the new year painting 2015 RED! 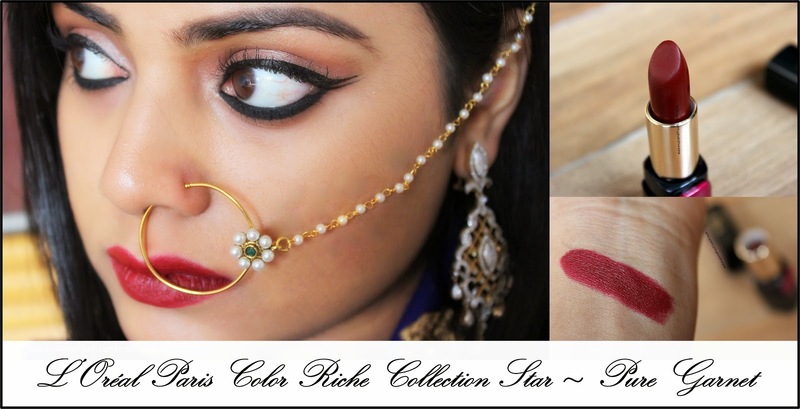 Presenting the Color Riche Collection Star range. A rouge for every woman. Discover a shade of red that is as unique as you are! The range includes 7 exquisite matte shades that are chosen by 7 Ionic L'Oréal Paris ambassadors. The shade that I was sent is Pure Garnet, chosen by Sonam Kapoor. Price - ₹995 for 4.2 gms. Oriflame had recently launched their Cream Eyeshadows called The One Colour Impact Cream Eyeshadow. 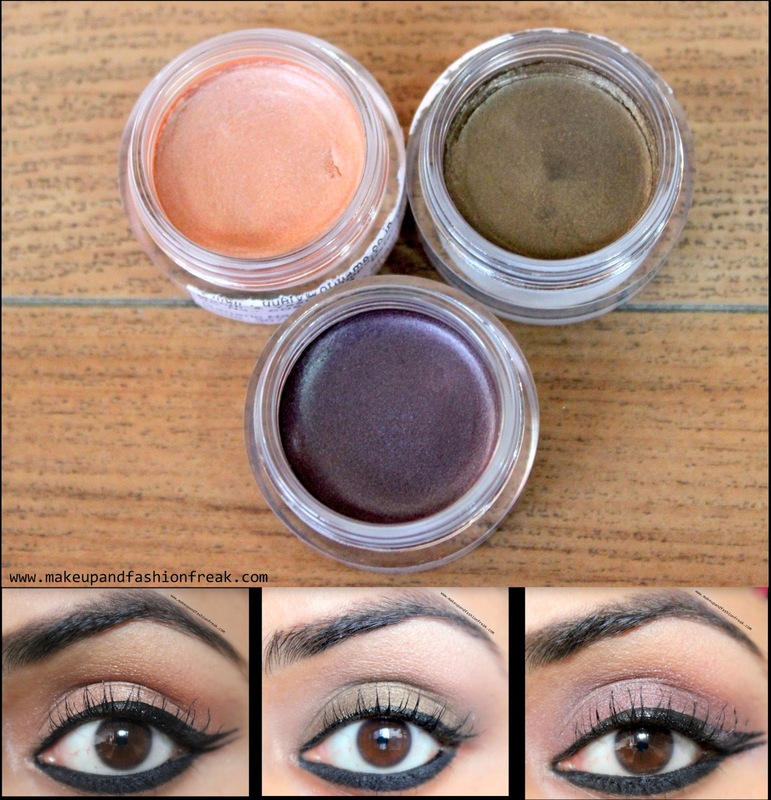 I have been testing them on my lids for quite sometime and I am pretty much impressed. Detailed review will be coming up soon. This is my first face wash that is all Natural and Chemical Free. I had bought it many months back (SEE HERE) and I am pretty much in love with it. There is only one thing that did not impress me much, more about it later. Lets get to the Claims and Ingredient List first. I used to have thick wavy, mostly unmanageable hair but due to continuous Hair Straightening and Smoothening, they had to go through a lot. Result ~ A lot of HAIR FALL. I am not saying that I won't get my hair Smoothened again. Infact I had got it done few months back but this time something unusual happened. The shampoo that I was provided irritated my scalp BIG TIME. My scalp became super itchy and also I got a lot of tiny but painful bumps on my scalp. I discontinued using the Shampoo and the Conditioner then and there and got myself a new shampoo. After The One Color Unlimited Lipsticks, Oriflame has come up with Matte Lipsticks in 10 pretty shades.